For this post, I have put together a collection of the best jigsaws currently available. 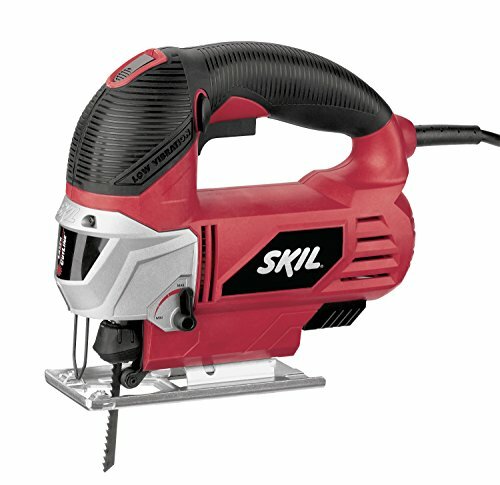 A standard jigsaw power tool is made up of an electric motor and a reciprocating saw blade. In addition, a some jigsaws feature a bevel function on the sole plate. This allows cutting angles of typically up to 45 degrees relative to the normal vertical stroke for cutting miter joints. Various numbers of TPI (Teeth Per Inch). Blade edge for cutting soft materials. Cranked blades to overcome the setback of the blade and allow flush cutting. Thin blades to allow tighter curves to be cut. Push stroke cutting blades to avoid damage to the top surface. The following jigsaws use the latest innovative components to meet your needs and help to ensure you do your best work. So here is my list of The 10 Best Jigsaws. 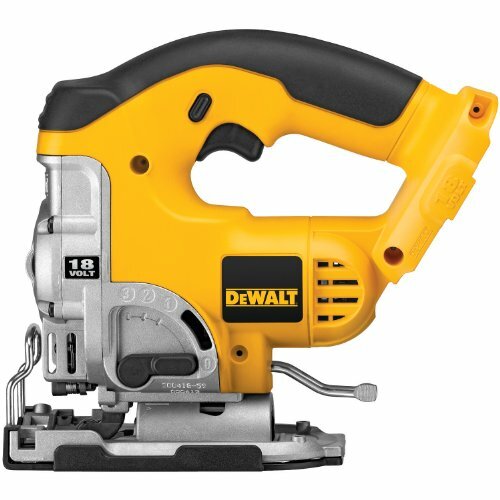 You don't have to sacrifice power and performance for cordless convenience with the DEWALT DC330B 18-volt cordless jigsaw. The professional-quality DC330B has a variable-speed, high-performance motor that's driven by an 18-volt battery (not included). 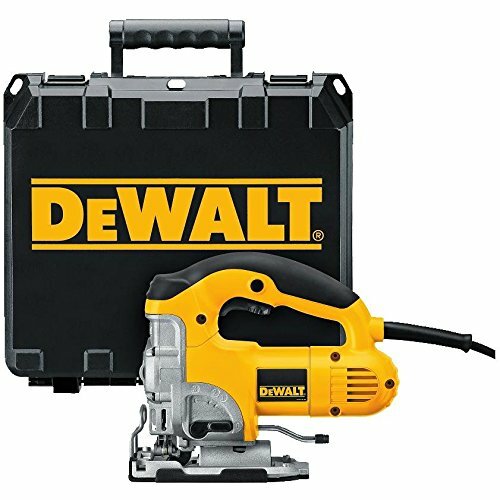 Speed range of 0-3,000 strokes per minute (SPM), the DC330B will cut straight and curves through virtually any building material, including solid wood, plywood, laminate countertops, plastic, metal, even nail-embedded wood. All-metal keyless shoe bevel features detents at 0, 15, 30, and 45 degrees, providing versatility for easy bevel cutting. Packed full of professional features, including a full 1-inch blade stroke length, keyless lever-action blade clamp for easy blade changes, and a four-position, orbital-action switch that lets you match the cut quality and speed to the material. Top-handle design for enhanced comfort and control, and it's complemented by an anti-slip comfort grip. Adjustable blower keeps the cut line clear of chips. Note: Does not come with a battery or charger. It's compatible with the DC9096 18-volt XRP battery pack and DW9117 15-minute charger. 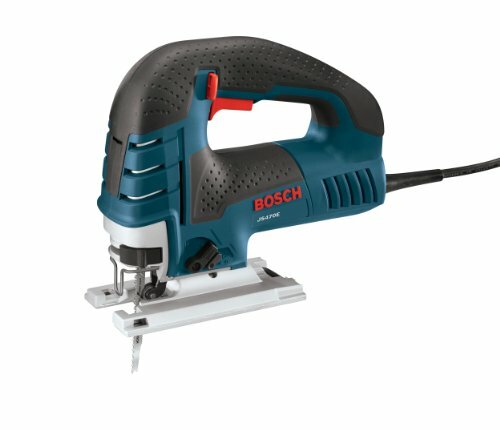 Bosch’s JS470E Jig Saw exudes power, durability, and precision. The robust cast aluminum footplate and industrial design can withstand the toughest jobsite conditions, including a drop that causes the tool to land on a footplate arm. 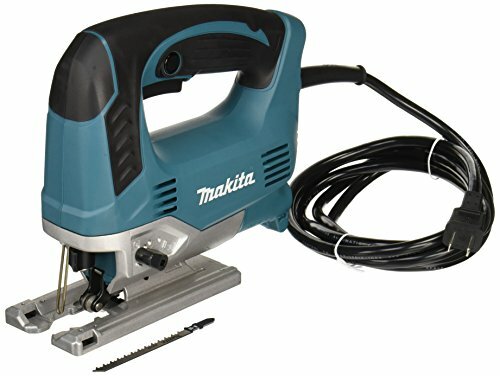 Cutting capability on wood up to 5-7/8-inches, on aluminum up to 7/8-inch, and 3/8-inch on mild steel. The maximum bevel cut angle is 45 degrees. To ensure your desired speed is maintained, Bosch has developed the Constant Response Circuitry so that you never have to worry about inconsistencies in your performance and precision. Adjust between four different orbital-action settings, allowing you to find the right blade strokes for smooth to aggressive cuts. Features a tool-less blade ejection lever so that you no longer have to touch hot blades when you want to eject them. Powerful 6.5 amp motor delivers the cutting power needed for the most demanding materials. Extra-large rubber grip dampens vibration and provides comfort during prolonged use. Non-marring plastic shoe cover protects soft or glossy materials from scratches from the shoe. Variable speed delivers 500 - 3,100 strokes per minute for optimal cutting speed for a variety of applications. All-metal gear case and keyless blade lever enhance tool durability in a professional shop environment. Positive bevel detents ensure accuracy at the most common angles 0°, 15°, 30°, and 45°. 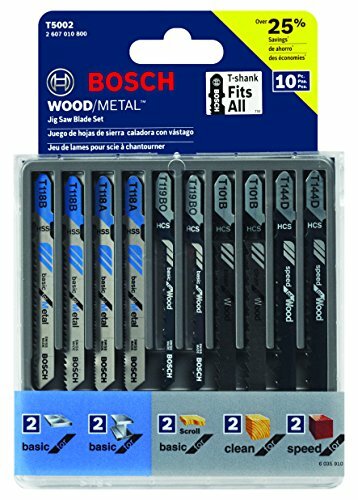 Accepts T-shank blades for optimal holding power and professional results. Low profile design engineered for improved handling in compact areas. Well-balanced design (only 5.2 lbs.) for reduced operator fatigue. Die-cast aluminum housing base for added durability. Built-in dust blower clears the line of cut for increased accuracy. Ergonomic rubberized grip and 2-finger trigger for increased comfort. Die-cast aluminum base adjusts from 0° - 45° right or left. 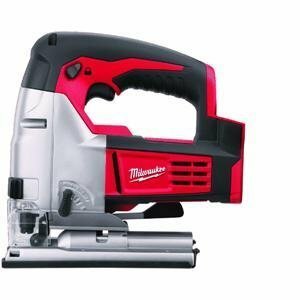 The Milwaukee 2645-20 M18 cordless jig saw is Milwaukee's first jig saw powered by a lithium-ion battery. 5-Position orbital setting offers more cutting versatility than any other cordless jig saw on the market. 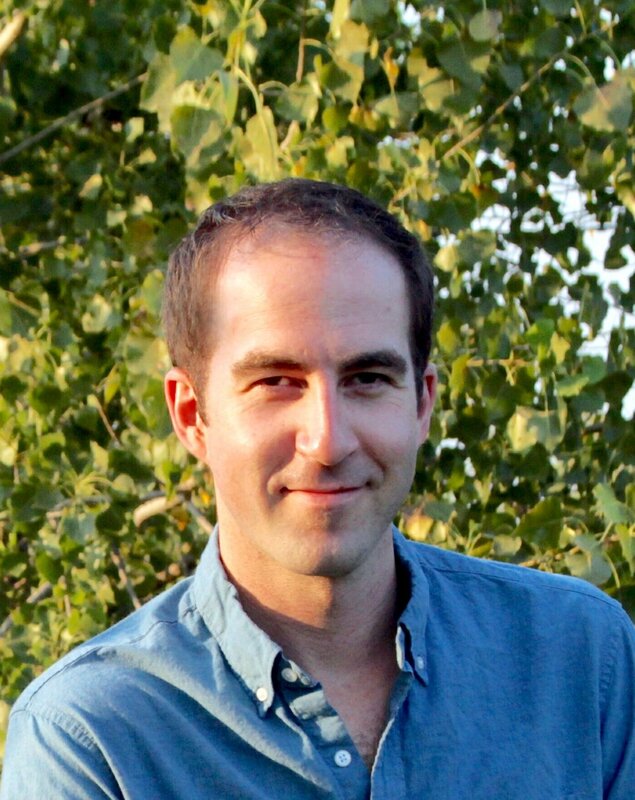 This allows the user to select the type of cut or speed specific to their application. For ease of use, the tool-free shoe bevel allows for quick and accurate shoe adjustments, while the quick-lok blade clamp provides fast and easy blade change. Note: Does not include battery, charger or case. 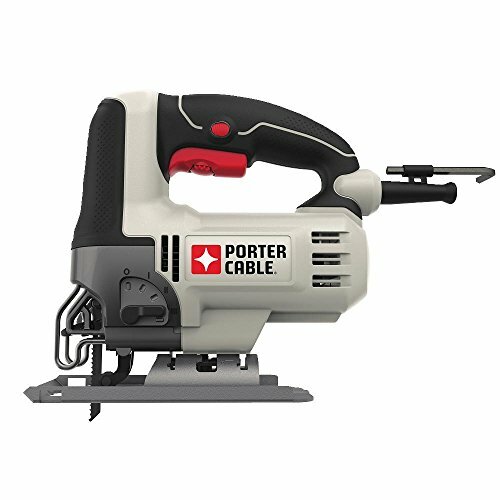 The PORTER-CABLE PCE345 6 amp Orbital Jig Saw is designed with a 7 position speed dial (0-3200 rpm) integrated into the trigger. Provides multiple speed settings for optimal cutting results. The 6 Amp motor delivers more power in demanding applications. 4 orbital settings provide best cutting performance in a variety of materials. Offers a lock-on button that provides easier control during prolonged use, and help to diminish user fatique. Oversized front and handle overmold that provide greater control and comfort during use. Offers tool-free blade change to make blade replacements fast and easy to minimize down time. 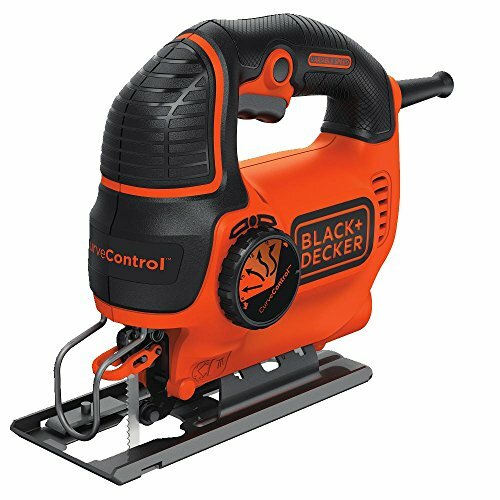 Black & Decker BDEJS600C 5.0amp Smart Select Jig Saw features Curve Control technology. Allows you to adjust the saw's orbit in 1 of 4 customized settings to help complete your specific project. The 5 Amp variable-speed motor generates up to 3,000 SPM of cutting power. This saw can make bevel cuts of up to 45 degrees and features an adjustable shoe for a stable cutting platform. New and improved Wire Guard which provides clear line of sight for precise cuts. Whether you’re tearing through lumber, cutting curves into plywood, or even slicing up sheet metal, you need a jigsaw. Powerful orbiting motor than can work up to 3,000 strokes per minute, adjustable with a switch at the top of the unit. Trigger lock system, which lets you focus all of your energy on controlling the unit without having to press the trigger. Will accommodate most T-shaped blades, though it is not compatible with U shaped blades. Works with Ryobi 18V batteries: P100, P102, P103, P104, P105, P107, and P108. 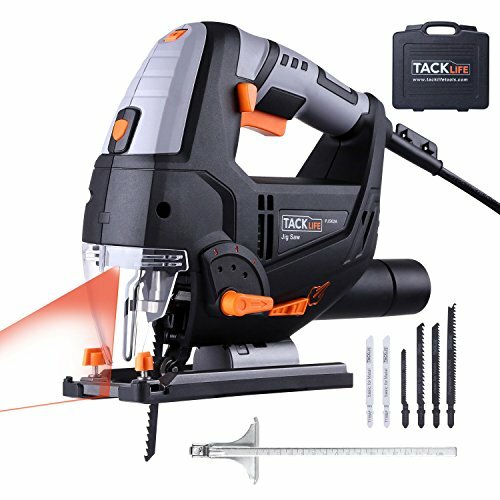 If power and precision are important in your woodworking projects, then this jig saw is for you. The 4-position orbital cut control lets you set the type of cut desired, from fast to smooth. Cut lines will be on point with the built-in laser guide. A unique stable foot design provides more control when starting a cut so ragged cuts are a thing of the past. Variable speed trigger adjusts speed to cut. Can make bevel cuts up to 45 degree in both directions while the adjustable shoe maintains cutting stability. 4-position orbital operation provides aggressive cutting of a variety of materials. 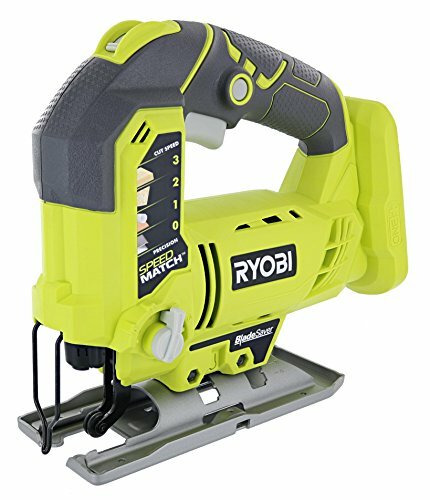 Sturdy with a lightweight design for less fatigue, this corded and durable saw is perfect for job site use or for DIY projects around your home. Comes with a laser guide to help with precise cuts the way you want them. Laser and LED lights can be switched on or off, allowing for visibility even in low light and dark areas. Low vibration and low dust design helps keep your workspace clean while you work. 6 different speed dial settings：1-4 for cutting plastic, 2-3 for steel plate, 3-4 for stainless steel, 3-6 for aluminum, 5-6 for wood. Includes 6 blades and carrying case. I hope this list of the jigsaws was helpful.